NECKLACE - SARAH COVENTRY. 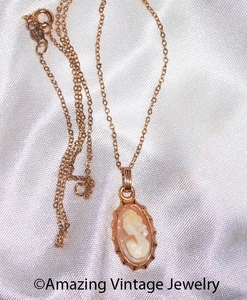 "CARNELIAN CAMEO" FROM CANADA. OVAL GOLDTONE FRAME WITH PALE PEACH AND CREAM CAMEO. 1/20 - 12k GOLD FILLED. PENDANT IS 1" LONG, 7/16" ACROSS. CHAIN IS ADJUSTABLE TO 16" AND 18" LONG. VERY GOOD CONDITION. THE CAMEO FIGURE IS SLIGHTLY DIFFERENT THAN THE US VERSION AND THE SILHOUETTE FACES LEFT IN THE CANADIAN VERSION VS RIGHT IN THE US VERSION. MARKED SARAH COV BUT NOT CANADA. IDENTIFIED BY SANDY STURDIVANT.